I'm really happy that you stopped by today because I have a special post to share with you! 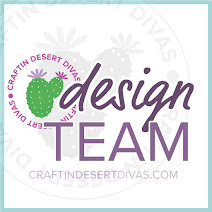 My sweet friend, Georgiana, invited me to be a "Guest Diva" over at Die Cuttin' Divas! 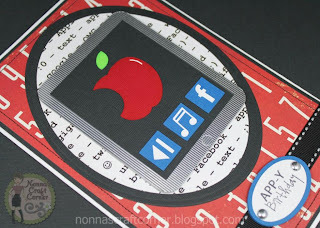 If you've never paid a visit to this fun Challenge Blog, you need to hop on over for a visit. They have some great challenges and a very talented Design Team, guaranteed to get you motivated! Thank goodness for electronic devices! Matthew lives a couple of hours away and a lot of our communication is through texting and emails. When I saw this image, I knew it would be perfect for his birthday, especially with that fun sentiment! * The iPad is an SVG from "Designs on Cloud 9". 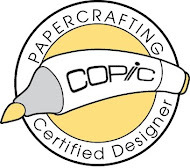 I cut the bottom layer from silver metallic paper twice and used pop dots between the layers. * The SVG has plain blue squares, but I added a few icons to my version. * The sentiment is from "Pink By Design"
* I didn't have any computer-related paper, so I just typed several "computer phrases", printed out my paper and used my oval Spellbinders to make my background mat! It's always great to work with the talented ladies at Die Cuttin' Divas and I'd like to thank Georgiana again for the opportunity. And, thanks to each of you for stopping by and leaving your sweet comments! Be sure to stop by Die Cuttin' Divas to see the sketch and get all the challenge information. I hope to see your creation linked up this week! Wow Tanya! This is so cool! I just love this image. You did a great job! What a perfect card for a 30 yo boy! 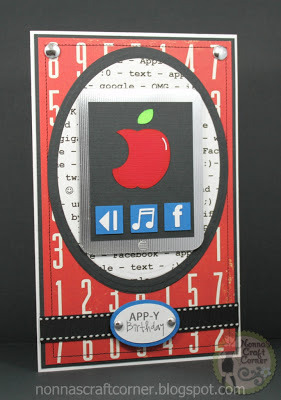 Great play on words and perfect for a techie birthday! 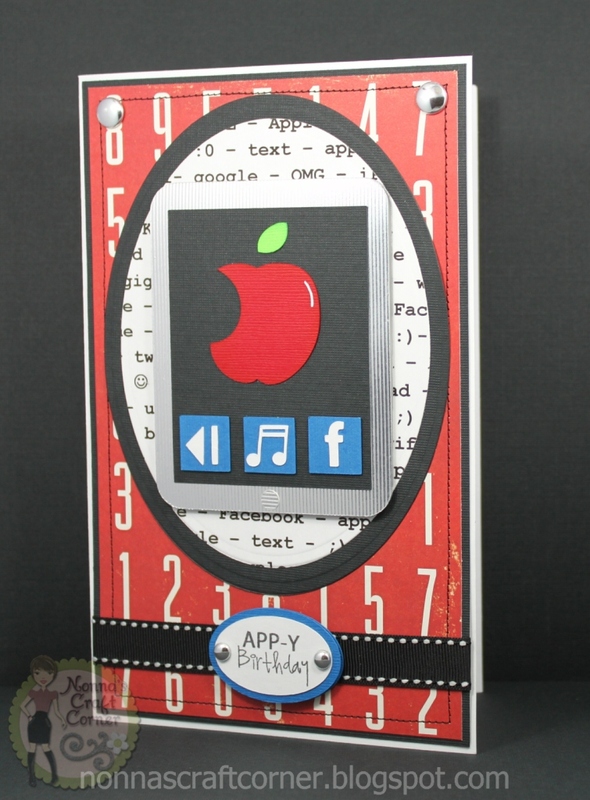 What a great teen card - love the design. Congrats on being a Diva :-))) Have a great day. Love this fun card. The buttons on the screen for music and play just look great. Congrats on DT spot. 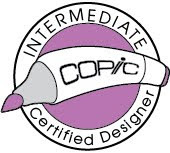 Great card, love the design, images and colors used. He will love it. 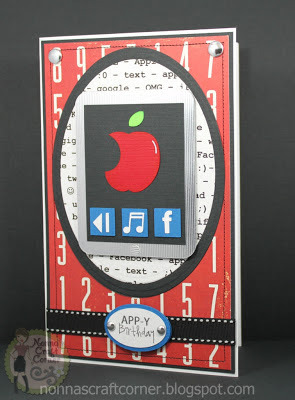 Perfect card for a techy guy!! Congrats on the guest DT spot!! Thanks for being our Guest Diva! This card is great--love the ipad image. Our sons and daughters will always be "our little" ones, won't they!? This is really cute, Tanya. Love the sketch but what you did with it is genius. He'll love it. Tanya ~ Happy Birthday to your baby boy!! Hehehehe!!! Okay this is so PERFECT for his birthday since he is so far away! LOVE that cut and so PERFECTLY done!! LOVE it! Always so fun stopping by to see what you have been up too! Congrats on your GD spot! Your card is amazing and I am sure he will love it! I absolutely love how you did the background paper...very clever my friend! What a wicked card. 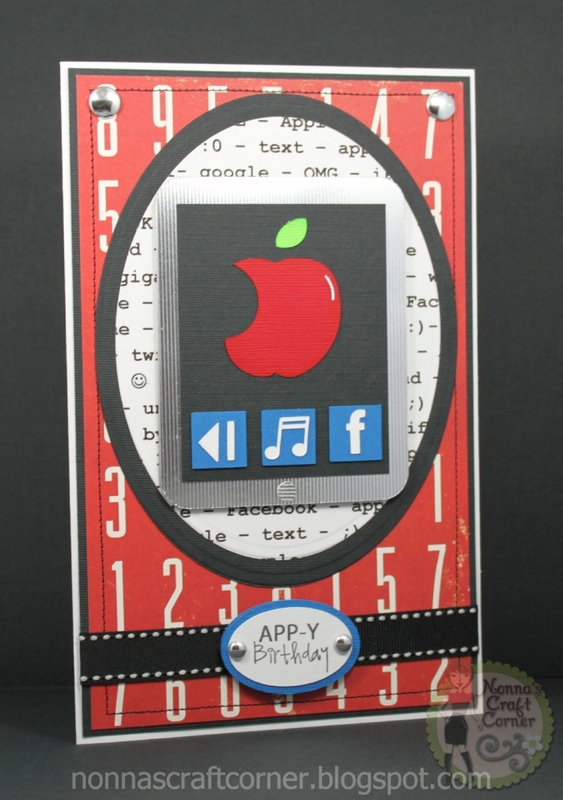 I love the "Apple" theme to this card. Thanks for being our Guest Diva this week at Die Cuttin' Divas.